REMODELED IN 2017! 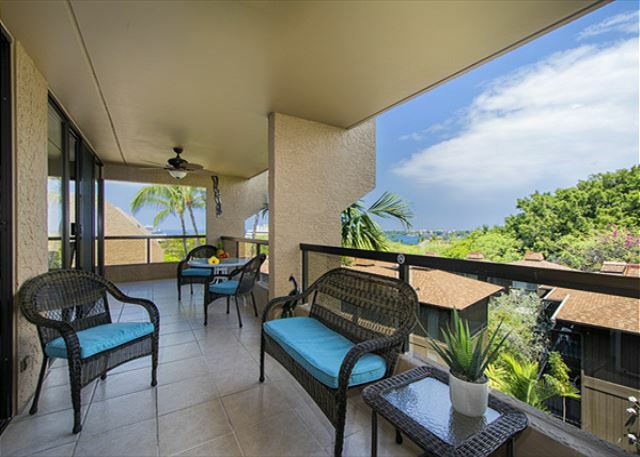 OCEAN VIEW, Huge Lanai, WALK TO TOWN! Elevator, AC!! Vacation rental condominium. Sleeps 6, 2 bedrooms, 3 bathrooms. No pets allowed. Welcome to the Living Area of Unit B-409! Ocean Views! Freshly painted, new furniture, very elegant remodel in 2017! Dining area with an ocean view! 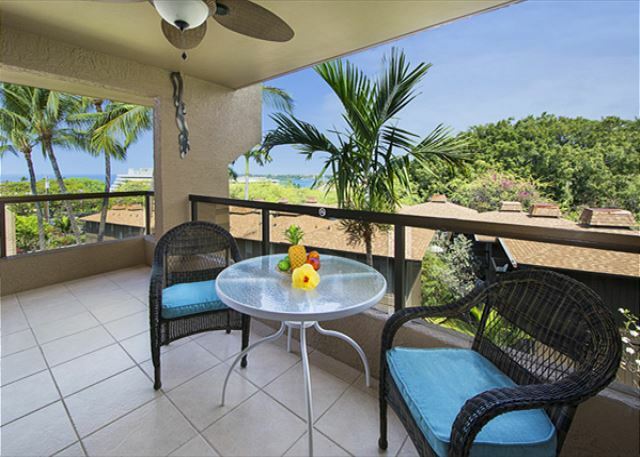 A beautiful ocean view from the lanai!! This is where we're sure you'll be spending most of your time! 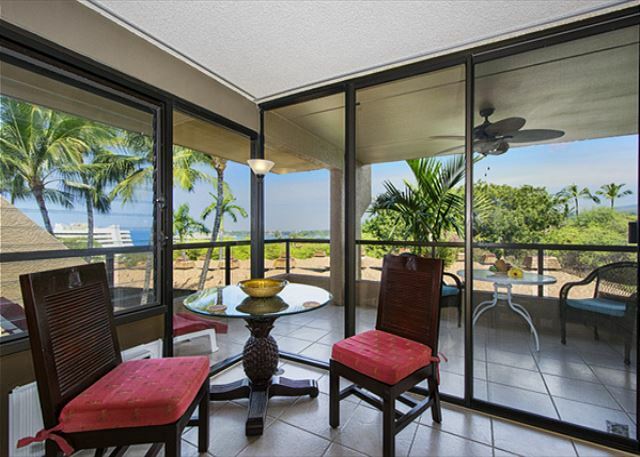 Lanai is extremely spacious with gorgeous ocean views! Time to come enjoy your Hawaiian Vacation!! Tasteful furnishings, amazing colors, great new fans installed! Amazing remodel in April of 2017!! This sofa is a queen sized sleeper sofa! Bar area off of kitchen! 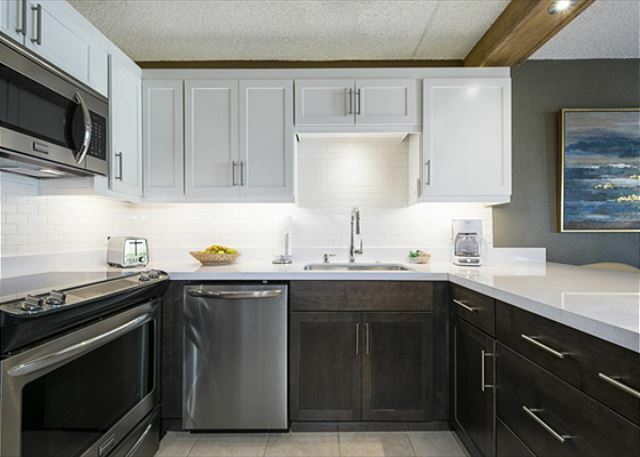 Absolutely spectacular remodeled kitchen with brand new appliances, countertops, cabinets. All done in April of 2017!! Such a gorgeous fully equipped kitchen! Lots of Room in the Master bedroom. Each bedroom has it's own TV as well! Master bedroom with comfortable Queen Sized Bed! All bedrooms have New Airconditioning Wall Units! 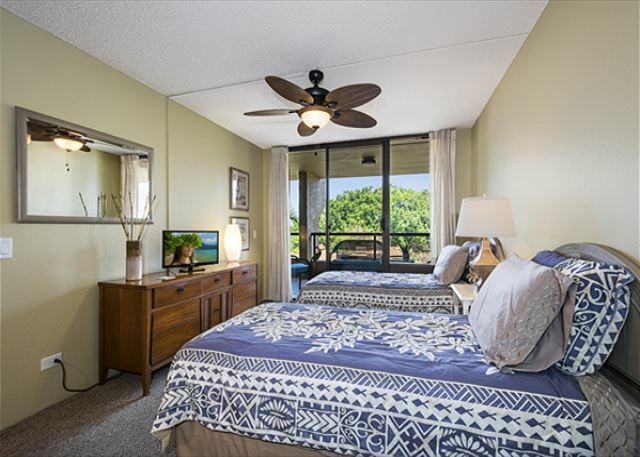 The Master bedroom has it's own Lanai Area!! Master bathroom! Brand new Vanities in all of the bathrooms in 2017! Master bathroom has a deep tub & shower! Tiles freshly painted! 2nd bedroom has 2 twins. 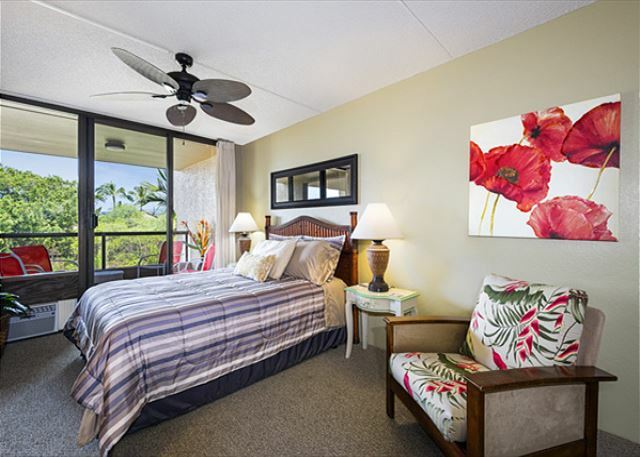 All bedrooms have their own entrance to the Lanai!! Another shot of the 2nd bedroom! 2nd bedrooms private bathroom! Brand new Vanity placed in 2017! The Foyer of Unit B-409! 1st bathroom, off of the Living Room! 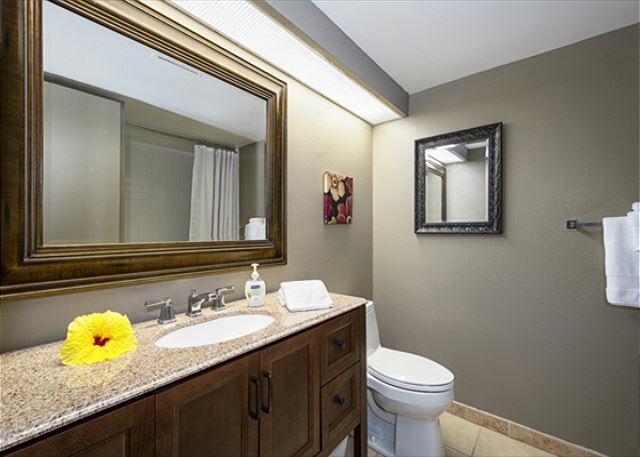 3 bathrooms is quite rare to have in a 2 bedroom condominium. Quite the amenity! BBQ by the pool, and come relax! New Pool area! Recently renovated! There is that amazing ocean view! Come stay at Kona Pacific B409!! 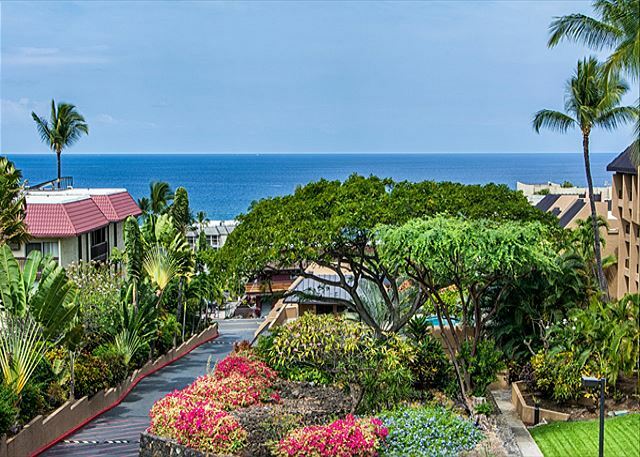 Kona Pacific B-409 is a newly remodeled upper floor condo with breathtaking ocean views! The owners have extensively made changes that every guest will absolutely LOVE! All completed in April of 2017! 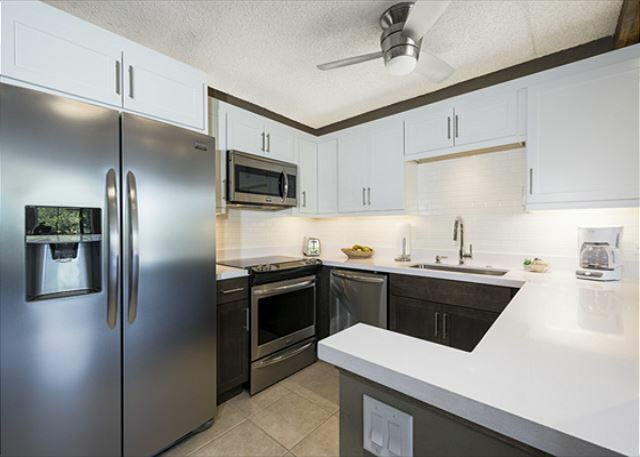 The entire condo has been freshly painted, there's new furniture, Kitchen & Bathrooms are extensively upgraded. 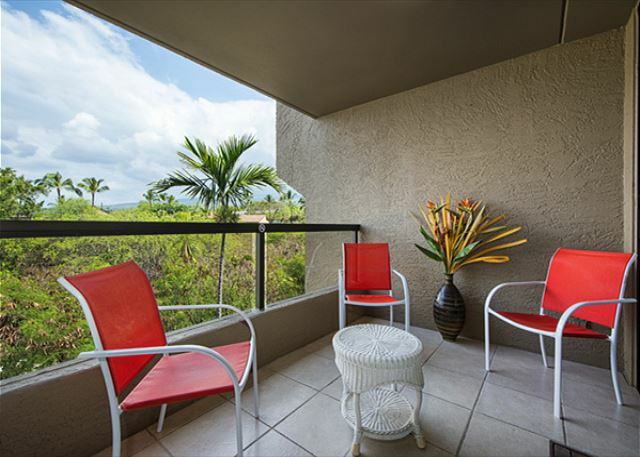 This condo has an extremely spacious lanai allowing access from all rooms: Living room, master bedroom, and 2nd bedroom. The owner has equipped anything you might need for your Vacation. 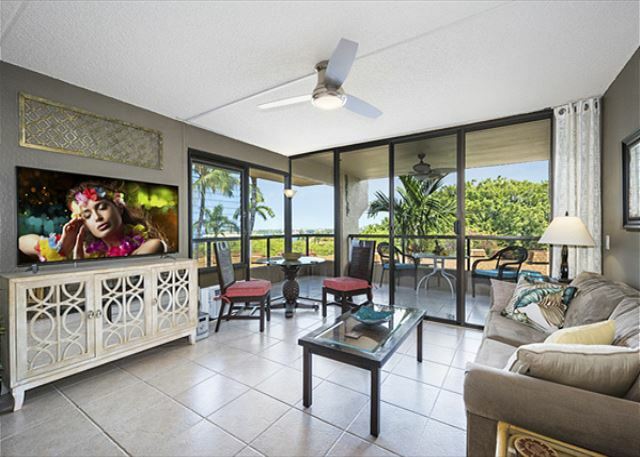 Wifi, Beach chairs & towels, TV's in both bedrooms & very large TV in Living Room! Brand new Air Conditioning in all bedrooms and living room! 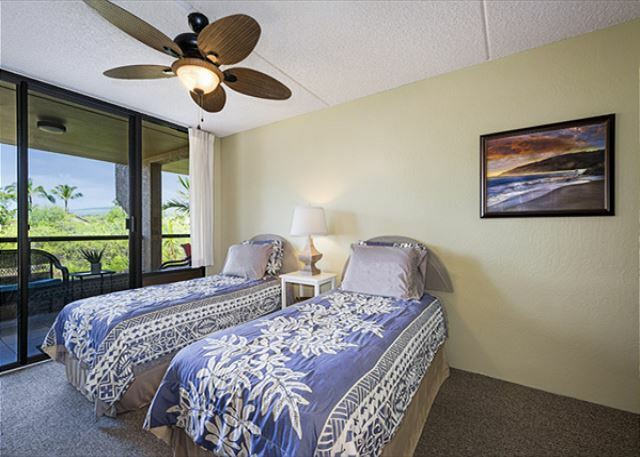 Overhead fans in every room, including the lanai to keep you comfortable. 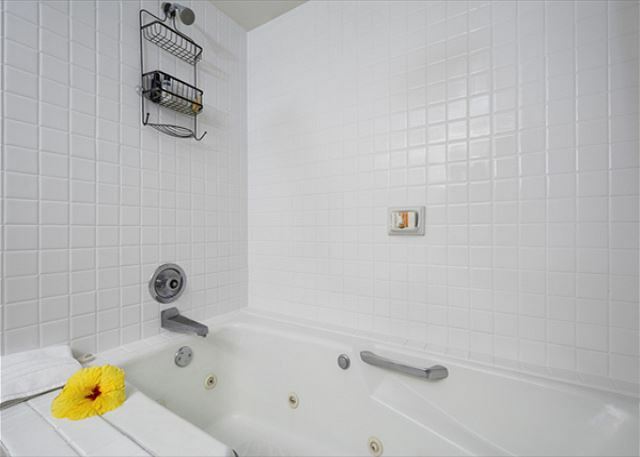 The master bedroom has a huge Jacuzzi style tub for soaking. 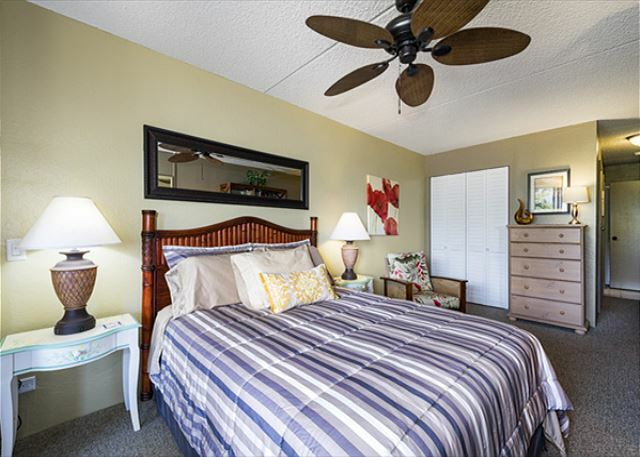 An excellent option for 6, as there is a Queen sized bed in the master, 2 twins in the 2nd bedroom, and a sleeper sofa! TAKE A VIRTUAL TOUR OF THE PROPERTY! **If link is not seen above, please inquire within to receive the link!! Enjoy an amazing Kona sunset, while feeling a strong tropical breeze. A perfect vacation destination. 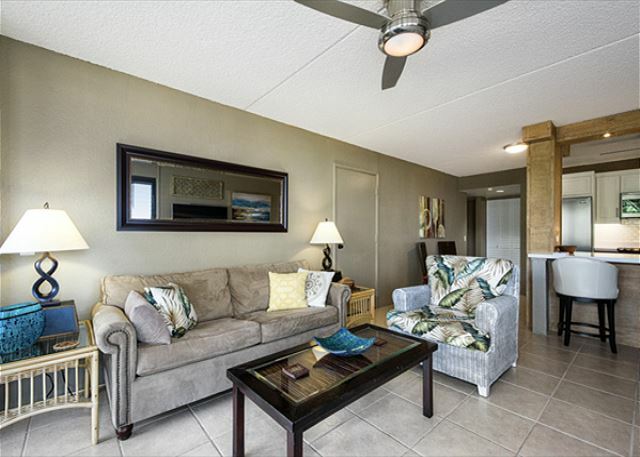 Complex has elevators, a large remarkable upgraded pool & BBQ area, and covered guest parking! 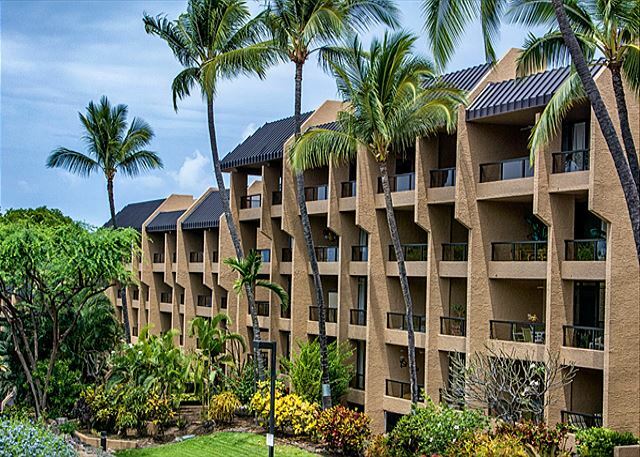 Kona Pacific is one of the closest complexes to Kona town to walk to restaurants, shopping, & the beach! 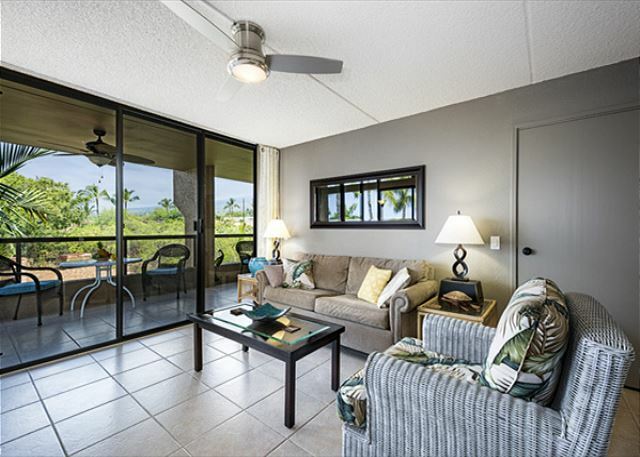 Overall, the condo was clean, Close to town, convenient, enjoyed having our coffee on the Lanai with ocean views, liked the elevator and fans in the condo. We enjoyed our 3 min walk to town. Great location everything easy to get to. Thanks for the kind words! We're happy to have had you. Mahalo! 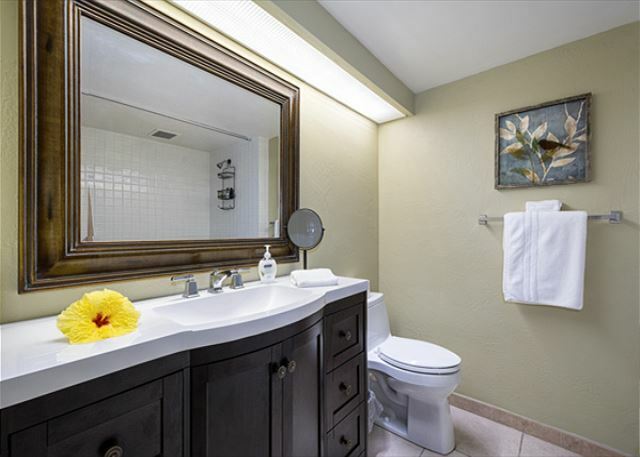 This property was very clean, well appointed, comfortable, and spacious for our party of four. The third bathroom was so handy when we had to be out the door in a hurry. The beds were comfortable and the extra fans at night made the a/c redundant as it was a little noisy. The view from the lanai was gorgeous. The location made it easy to walk into town as parking was minimal. Would be my first choice to stay on a return visit! Many thanks for the kind words, Rose! 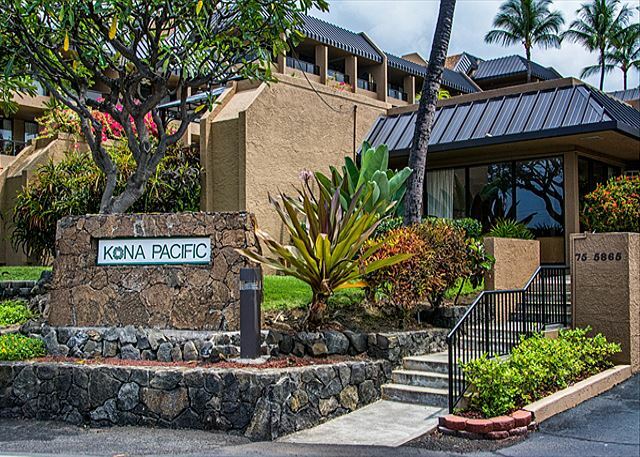 Truly happy to hear that you enjoyed your stay, and that the location of Kona Pacific was so convenient for your stay. We'd be honored to have you again with us in Kona. Mahalo! We spent 5 great days in Kona and can’t say enough about our stay in the condo. Place is outstanding. Rooms and beds are great. Plenty of space and within minutes of getting into Kona. Great patio and view. Would come back ina heartbeat!! Plenty of room for everyone! Quiet and beautiful!! We enjoyed having the 3 full bathrooms so each night our kids had their own shower, especially since we swam in the ocean daily. Queen's bath is a great beach for kids and adults, check it out it is very close. This place is not only beautiful but quiet and peaceful. The thrill of the night life being right in Kona is spectacular. 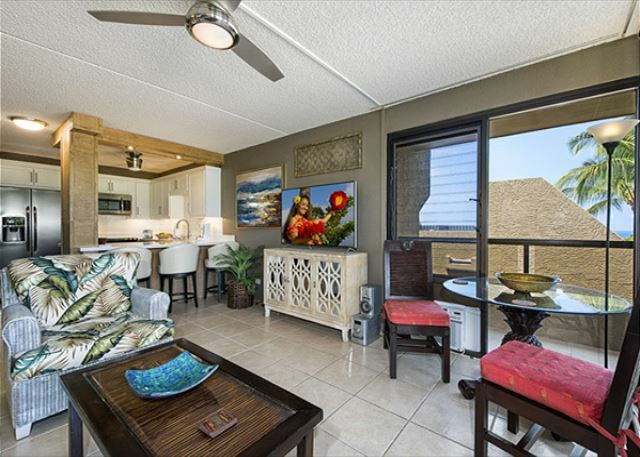 You must visit this unit, 4th floor with ocean views, newly remodeled, gorgeous! 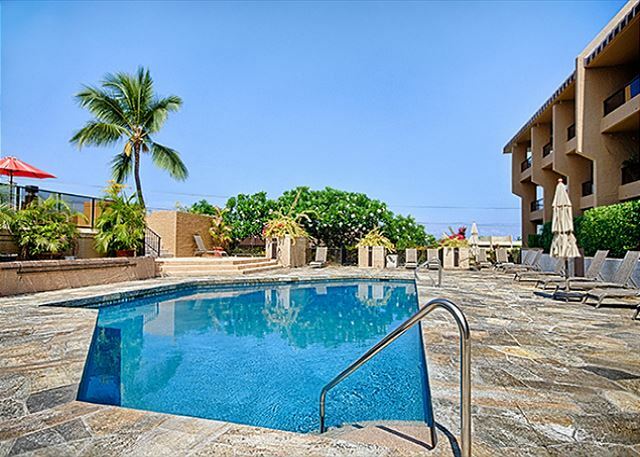 This property definitely contributed greatly to our Hawaiian vacation. The best part is the balcony overlooking the ocean. Everything else was very nice and convenient. First of all the management company was great, as a property manager myself, I know the importance of a flawless arrival or move in. This was so easy and I had all the info needed way before arrival. I give the management company an A+ because I did not have to call them once. This condo was a great place to stay. I have lived in Kona and you cannot get a more central location than this. The lanai was fantastic, the view was amazing, it was quiet and relaxing, the pool area was fantastic. Just a perfect place to stay. Easy to park, elevator was close to unit, perfect. Suggestions I would make would be to make sure the shower curtains are clean or new (this is the reason for my 4 stars only for cleanliness, my shower curtain was gross) , in the master bath there definitly needs to be something to hang on to getting in and out of the tub, more utensils there is definitly not enough for a family staying there, tea towels and dish cloths would be essential to keeping the place clean. Also they can be easily washed with the bath towels. One last thing that I would change if it were my rental would be the carpets. They are not horrible but definitly could make the place 100 percent if they were not there. I hope this gives a future tenant an idea of the vacation rental, my suggesstions are basic and in no way would keep me from renting this place again. This will always be my first choice for a place to stay. Lovely Condo with a Fantastic view! Management was very responsive when we arrived and discovered the unit did not have a coffee bean grinder and/or an alarm clock. These items were delivered to us within an hour. Instructions on how to operate the living room TV, the stove, and dishwasher would be helpful. The condo would benefit by the addition of a couple of beach chairs. Lovely unit with a fantastic view! Unfortunately, the condo below ours was undergoing remodel the entire three weeks we were there causing undesirable noise during the day but it is very quiet at night. We would definitely consider booking and would recommend to friends. We had wonderful food at the Fish Hopper, Kona Inn and Quinn's almost by the ocean. Great location close to everything. Quiet complex, spotlessly clean. We had a fantastic time. We stayed in this condo Sept 2017. 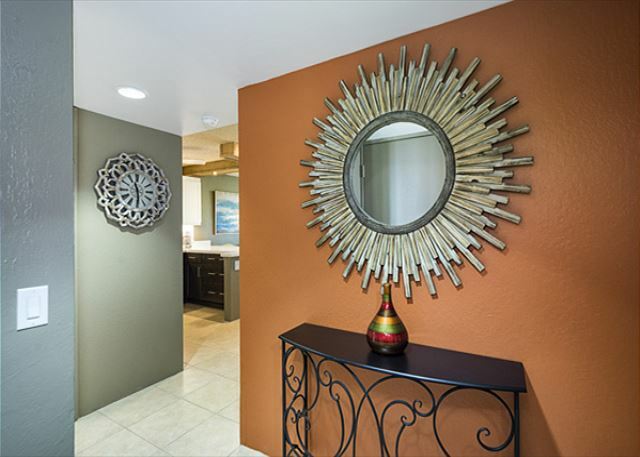 It is beautifully remodeled with modern kitchen and 3 FULL bathrooms. The view from the living room is fantastic, watch the sun rise and set right from the wrap around deck or on the comfort of the AC in the living room. A quick stroll and you'll be in the heart of downtown with restaurants, bars, shops galore! We highly recommend this property, my husband and I will definitely return! 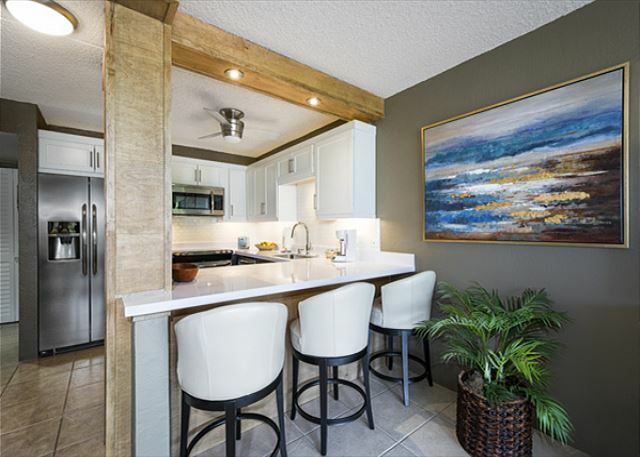 This is a great updated condo. Beautiful ocean view, kept cool in the air conditioning. Enjoyed eating on the lanai. Very clean. Very comfortable space to relax after a busy day, and to plan our following day. There is plenty of room and having bathrooms a plenty was great with a family. We very much enjoyed our stay here, and hope to return again. Had a fantastic holiday, it was a home away from home. The apartment was in a perfect location, we could walk to restaurants and bars and go shopping. Everything we needed was at there for us. It was great coming home at the end of the day and being able to relax with a great view of the water. I would definitely come back. It was a very comfortable apartment. Huge in size. 2 rooms with 3 bathrooms! Simply the best. No regrets at all. Well located. Central and parking was a breeze. There was also a huge fridge with an automatic ice dispenser. The washer and dryer were really effective so we did loads of laundry in no time. Absolutely fabulous. 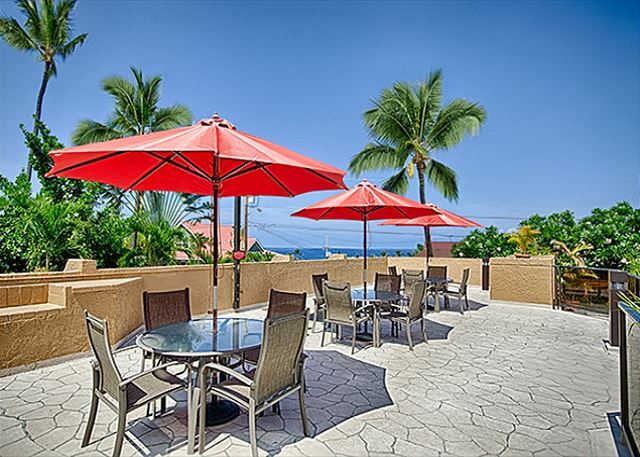 We had a gret time in Kona due to the condo's location, location, location! 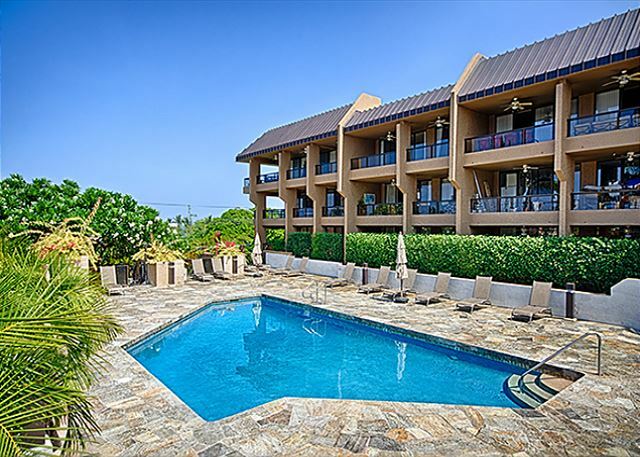 Only a few blocks to downtown Kona but also easy access to the highway. We traveled to Captain Cook, around the south of the island to Volcanoes National Park to Hilo and back to Kona over the Saddle Road. Also went to the Kohala Coast and home thru Waimea hills,green fields and paniolo country. 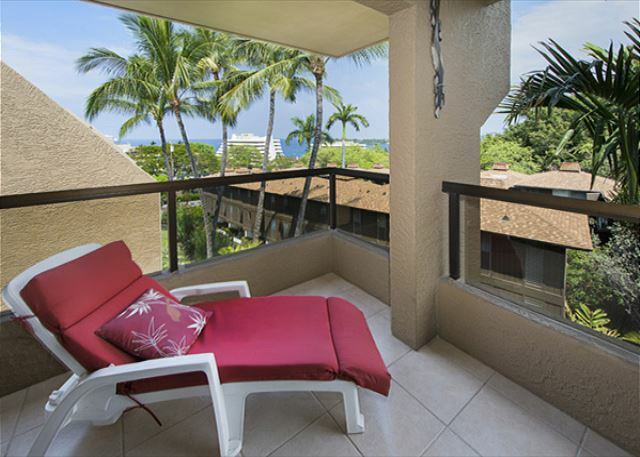 The contemporary condo has a bay view and lanai from which to view it. Comfortable beds, easy to use kitchen, 3 bathrooms, washer and dryer, large TV. A good time was had by all. This is a very nice condo; clean, quiet, well appointed. 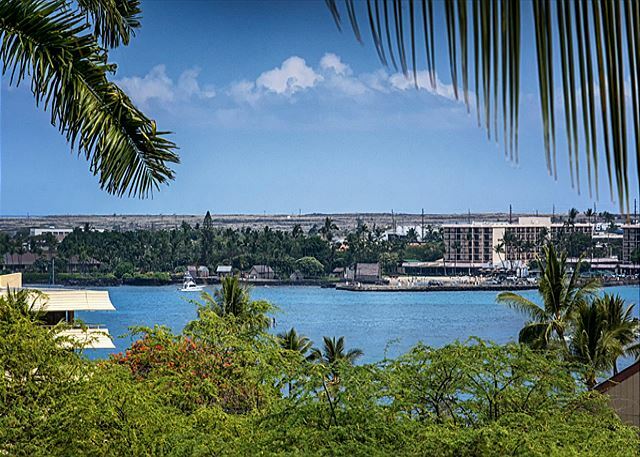 The view out over Kona and the bay is wonderful. It is within easy walking distance of all the shops and restaurants. The rental was nice and clean, great view and close walking distance to everything. My family felt very at home and relaxed, such a beautiful way to wake up in the morning with our view. Excellent place to stay, central to shops, beaches, restaurants, rental catered extremely well for our family of 6, very clean would recommend highly. The condo was great, walk to town, dinner , to the beach or just hang out on the wonderful view deck. Covered parking and a pool to enjoy. Would stay again or recommend it to anyone.